Lu Weibing, Redmi CEO revealed yesterday on an event held at Xiaomi Shenzhen R&D Institute that a plan to launch new Redmi flagship smartphone is in process. The new Redmi flagship smartphone, according to Weibing will run on the latest Qualcomm’s Snapdragon 855 SoC. 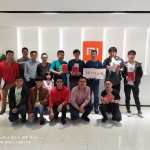 The Redmi boss revealed the information on a post he made on Weibo after a successful meeting he held with his crew on the Xiaomi Shenzhen R&D Institute where they discussed in detail about Redmi’s future brand positioning, marketing strategy, user needs, and flagship product configuration. Much details of the upcoming flagship smartphone are yet to be released, but we are hoping it will be coming with some dope features plus the latest Snapdragon 855. Meanwhile, Redmi Note 7 has been successfully launched and Redmi Note 7 Pro will be debuting soon.